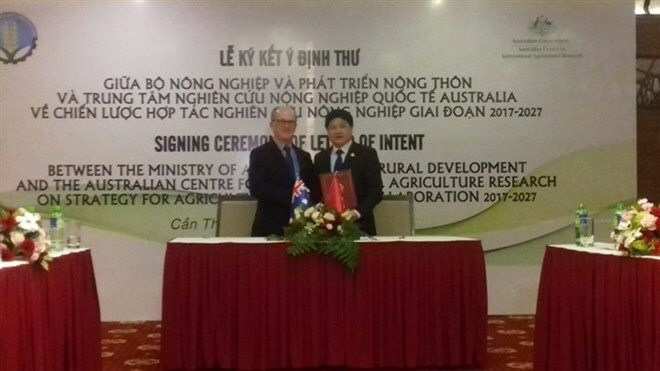 Can Tho (VNA) - The Ministry of Agriculture and Rural Development (MARD) and the Australian Centre for International Agricultural Research (ACIAR) on August 21 signed a letter of intent to enhance bilateral cooperation in agricultural research. The letter was signed by Le Quoc Doanh, MARD deputy minister, and Peter Horne, ACIAR’s general manager for country programmes, on the sidelines of the APEC Food Security Week now underway in the Mekong city of Can Tho. Speaking at the signing ceremony, Doanh said that many joint projects between ACIAR and Vietnam had added value to Vietnamese agricultural products, and had enhanced Vietnam’s agribusiness sector and capacity of scientists and researchers. "The signing of the letter of intent today is the result of great bilateral cooperation, with joint efforts from researchers and policymakers on both sides," Doanh added. Horne said the new partnership would have mutual benefits for both countries. ACIAR, which began its work in Vietnam in 1993, has completed 170 projects in the country, worth almost 100 million AUD (72.9 million USD) in investment in research. The 10-year strategy provides a roadmap for Australia and Vietnam to work in equal partnership with mutual contributions and benefits for economic growth, security and innovation, according to Horne. The strategy will guide future programmes in collaborative research, including research themes, geographic foci and funding priorities from 2017 to 2027. In the next decade, ACIAR will cooperate with MARD and other partners to continue assisting Vietnam in addressing obstacles to agricultural development under six research areas: food safety, climate change, soil fertility improvement and crop efficiency, better market engagement, and improvement of value from forests and aquaculture. ACIAR will implement research all across Vietnam, focusing on the Mekong Delta, Central Highlands and northwest Highlands. Collaborative projects will focus on highly applicable practices, creating opportunities for women to participate in and benefit from research, agri-business systems and on-farm activities.